On the night of October 31, 1993, paramedics received a call of a man lying unconscious outside the club known as the Viper Room. The club was party owned by actor Johnny Depp who was in attendance that night. Paramedics arrive and recognize the victim as River Phoenix. He later dies at the age of 23 from an overdose of cocaine and heroin known on the streets as a speedball. He leaves behind his parents and four siblings. His untimely death shocks the film industry and millions of fans across the globe. The events of that night also shed light on a widespread drug culture in Hollywood and the ease of access in which many child stars have in obtaining them. Phoenix’s fatal last dose was eerily similar of the death of comedian and actor John Belushi nine years earlier. At the time of his death, Phoenix had been filming “Dark Blood” and had returned to Los Angeles on a break from filming in the deserts in Utah. I vividly recall the news reports of Phoenix’s death and his role in Rob Reiner’s “Stand By Me” is my personal favorite. I’ve often heard that if he had lived and stayed clean, there was a high probability that he would taken many of the rolses that went to another rising child star, Leonardo DiCaprio. The biggest tragedy in his death besides his age and the love ones he left behind, is the list of possible directions his career could have taken. We can only speculate as to where he would be in life now and what he would think of the Hollywood we currently see. In the short time that he did spend on earth, he left a permanent mark on the film industry and American cinema. Gavin Edwards takes us back in time to revisit Phoenix’s life from his birth, nomadic life with his parents and his entry in Hollywood and the demons that he developed that would later claim his life. The book is an interesting look at Phoenix and the dark side of the film industry. Hollywood can be a mysterious and strange place to outsiders but books such as these provide us with a window of normalcy familiar to the average person. It is often said that artists live in a completely different world not out of preference but out of circumstance. His transformation from child star, animal rights activist to a film star with a crippling addition is similar to the lives of other stars such as Corey Feldman, Corey Haim and Kiefer Sutherland to name a few. Great stars whether they’re actors, musicians, artist or writers, are far and few in between. And tragically, the greatest stars are sometimes those that do not live for very long. But in their careers they help to create entertainment that lives forever. 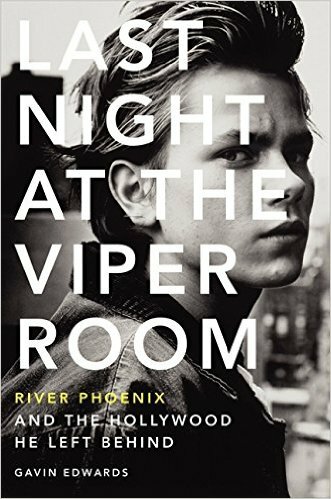 Posted on February 6, 2016, in Biographies and tagged River Phoenix. Bookmark the permalink. Leave a comment.